This page is dedicated to the frequently asked questions about first aid certificates. Candidates that successfully complete a first aid and / or CPR course will receive a certificate that is valid for 3 years. Candidates may be required to renew certification at a earlier date based on employer or school policy. Check with your employer or school to determine how frequently you have to renew your certification. Can I re-certify my St. Johns certificate through the workplace approved? As long as candidates have completed previous certification within the past 3 years through a credible provider in Canada they are eligible for a re-certification via the workplace approved. Yes, candidates that have certificates through other credible providers can take a re-certification course through the workplace approved. All providers essentially offer courses with the same first aid and CPR material. What do I do if I have lost my first aid certificate? If you have lost your first aid or CPR certificate contact the training provider (i.e. workplace approved) for a new certificate. The training partners can not issue certificates to candidates that have lost the award. What should I wear to a first aid certification course? Wear comfortable clothes. You will be moving around quite a bit and working from different positions. Comfortable shoes will definitely help. Are first aid and CPR certification courses difficult to pass? No, most candidates do not have a difficult time passing the course. Most credible training partners allow candidates to re-take the course at no extra cost if they do not complete the course the first time. Do I have to write a test? Yes, candidates that take first aid and CPR courses will have to take a simple multiple choice test. A minimum grade of 75% is required to pass the course. Most candidates have no difficulty passing the written test. 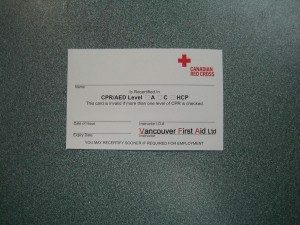 Candidates that successfully complete the first aid and / or CPR course will receive a wallet sized certificate. Candidates can also receive a wall-mount certificate at a small additional fee. How much does a first aid course cost? First aid courses vary in price depending on the type of course and your location. Courses vary in price from 75 to 160 dollars. Re-certification courses vary in price from 35 to 110 dollars. Can I laminate my card? No, do not deface or laminate your card. Any changes to the certificate will make the award void. Which provider is the best provider in first aid and or CPR certificates? We strongly recommend the workplace approved. They are the leaders in first aid and CPR certification worldwide.